Wood furniture repair and refinishing is our specialty. If you need to repair wood furniture give Legeir Woodworking a call for a fair price and high quality workmanship. We can repair scratches on wood furniture and repair furniture finishes and even a full refinishing restoration for any type of wood furniture and even cabinetry. We are also able to perform antique wood furniture repair for high quality wood furniture pieces. We are able to repair damaged wood furniture even repair or replace missing or broken pieces of wood furniture. 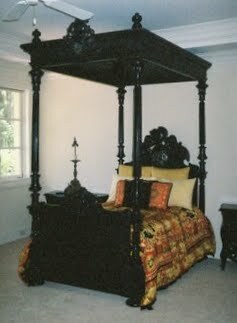 For example, in Atlanta, when Janet Jackson's master four post bed was moved by a moving company one of of the posts on an exotic four post bed was lost. James Clark was called to do the specialized task of recreating the mahogany wood post, and match the finish to the existing three posts. The end result was an undetectable recreation of the mahogany post and a very happy Janet Jackson. repairing wood furniture is as easy as calling James L Clark Jr. who has been in the business for 36 years and will be able to make any repairs or improvements as efficiently as possible resulting in lower prices and better finished quality product than other industry standard options.